Do you love to surprise your customers as much as we do? 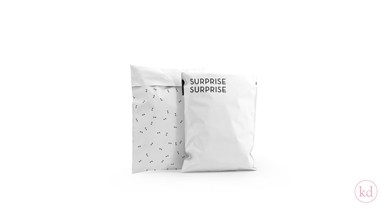 With this Stylish yet playful Surprise surprise post bags you can sure do that! And at the backside you find our cute bow pattern! We made them from recycled LDPE, with black color inside, so it will not cause any see trough effect! They have a double closing strip. So your customer can use the bag to send products back. Easy for you, easy for your customer. What a great surprise!